» Chlorophyll a and primary productivity data for various lakes near Toolik Research Station, Arctic LTER. Summer 2000 to 2009. 1975-1991: Water samples were collected and filtered through a Gelman A/E glass fiber filter. Filters were extracted in the dark for 24 hours and read on a Turner 111 fluorometer with a primary filter of 670 rattan, secondary of 64 rattan red and a blue T3 bulb is used. Algae was incubated for 24 hours, filtered onto a .45 um Metricel filter and counted with a liquid scintillation counter. 1992-1994 the water was filtered through a 47 mm Whatman GF/C glass fiber filter. The filters were placed in 10 ml of 90% acetone and extracted in the dark for 24 hours at room temperature. The samples were then read on a Turner 450 Fluorometer with an NB 440 filter and a left side emission window of 10x and a right side activation window of 30x. The fluorometer was calibrated using a standard curve made using chlorophyll a from Anacystis nidulans purchased from Sigma and quantified using a spectrophotometer. 1995-1997 The methods from 1992-94 were continued but the NB440 filter on the Turner 450 Fluorometer was replaced with the NB430 filter. 1998-2000 The water was returned to the lab where it was filtered through a 47 mm Whatman GF/C fiber filter. The filters were placed in 10 ml of 90% buffered acetone (1 mg/l MgCO-3) and extracted in the dark for 24 hours at room temperature. The amount of chlorophyll a was then read on a Turner Design 10-Au-005-CE configured with a chlorophyll optical kit: photomultiplier tube 185-870; daylight white lamp, F45T5 400-600 nm; excitation filter 340-500 nm round bandpass 5-60; emission filter >665 nm round sharpcut 2-64; reference filter 400-700 nm square 1 ND. The Turner Designs 10-Au-005-CE fluorometer was calibrated using two chlorophyll a standards of known concentrations obtained from Turner Designs. Each time samples were run the Turner Designs 10-Au- fluorometer solid standard was also run. 2001-2002 Water samples were filtered in the field through a Millipore 47 mm filter cassette (SX0004700) containing a Whatman GF/C (1.2 um) glass fiber filter. This filter was returned to the lab and extracted as described previously in buffered acetone. The Turner Designs 10-Au-005-CE was configured with a chlorophyll optical kit 10-037R. This kit used for traditional in-vivo measurements of chlorophyll (Lorenzen) and in-vivo/extractive acidification methods, including Strictland and Parsons; standard methods for water and waste water and EPA 445. 2003- Samples were collected in 2 litre brown Nalgene bottles and returned to lab within 2 hours. All other methods follow from 2001. Samples in 2003 were also acidified with 100 ul of 1N HCl for 90 seconds to determine pheophytin concentrations. 2004-present Samples were collected as in 2003 but filtered through a 47 mm Whatman GF/F (0.7 um) glass fiber filter. Filters were placed in 10 ml of chilled, buffered (1 mg/l MgCO-3) 90 % acetone and extracted in the dark at approx. 4 deg. C for 18-24 hours. In 2004 a multipoint curve was analyzed using a chl a stock standard. The Turner Design solid standard could then be used as a check. Chl a was corrected for pheophytin following EPA 445. Samples were acidified with 300 ul of 0.1N HCl for 90 seconds to correct for pheophytin. Primary production is determined by uptake of 14C labeled bicarbonate in the particulate fraction and conversion into carbon assimilation (Wetzel and Likens, 2000). For in-lake incubations (both in-situ and different lake), subsamples of the water collected from a specific depth with the Van Dorn sampler are placed into a 70 ml bottle (2 clear and one dark bottle for each depth), 5 uCi of 14C bicarbonate is added, and bottle sets (2 clear, 1 dark) are incubated at collection depth for 24 hours. After 24 hr (+/- 1 hr), water samples are vacuum filtered through 0.45 um Gelman GN-6 filters. Filters are air dried in mini-scintillation vials for at least 24 hours. The filters are then dissolved in 1 ml cellusolve before the addition of 5 mL scintillation cocktail (Scinti-safe). After the addition of Scintisafe, samples are placed in the dark for 24 to 48 hours prior to counting on a liquid scintillation counter (Packard Tri-Carb 2100TR). Sample exposure to light is minimized during all phases of the procedure. - Prior to 2000, 0.45 um Millipore HA cellulose filters were used for primary production analysis. Tests comparing these to the Gelman GN-6 filters currently used show no difference. - Fertilization of lakes E 05 and E 06 caused an increase in biomass filtered and necessitated that subsamples of a known volume be taken from samples at these sites. From 2002 to 2004, this procedure was used as necessary. From 2005 onward, the entire sample was filtered through two filters in equal volumes. Both filters were placed in the same mini-scintillation vial and counted as one sample. - Prior to 2006, the working solution was 50 uCi/mL and 100 uL was added per sample. This was the result of an inadvertent experiment where 3 times the amount of working solution was added to the sample. We did not observe a similar increase in our resulting estimates of primary production. It was determined that the working solution had forced the sample to conditions of carbon limitation because of the shift in pH (WS pH ~ 9). Therefore, we increased the activity of the working solution and reduced the volume added to a sample. Steeman Nielsen, E.. 1951. Measurement of the production of organic matter in the sea by means of carbon-14. Nature. 167:846-685. Wetzel, R.G., and G.E. Likens. 2000. Limnological analyses. 3rd edition, Springer. Miller, M. C., G. R. Hatter, P. Spatt, P. Westlake, and D. Yeakel. 1986. 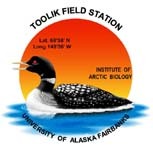 Primary production and its control in Toolik Lake, Alaska. Arch. Hydrobiol. 74: 97-131. Evans, M.A., S. MacIntyre, and G.W. Kling. 2008. Internal wave effects on photosynthesis: Experiments, theory, and modeling. Limnol. Oceanogr. 53(1), 2008, 339-353. Kling G.W. et al. 2000. Integration of lakes and streams in a landscape perspective: the importance of material processing on spatial patterns and temporal coherence. Freshwater Biology, 43, 477-497. March 2016- Data values, sites, dates and metadata corrected and updated and version 5 of this file was created.